Damn..... i want that Harpuia figure. Ugh... so tempting. I don't have time to paint and assemble, but I do so badly want a rockman to adorn my mantle. 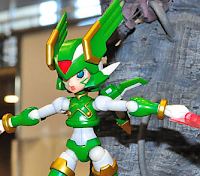 Dimension Diver Rockman... DO WANT. I remember just staring at a picture of it a while back. It looks so awesome, though I dunno if I'd want to keep one since it'd end up getting just stuffed in a box. cool Harpuia figure. . kinda has a big head though, but it's still neat.